Have you started your Christmas list yet? I have. I can’t wait ‘till the end of the month. I shop for Christmas presents at Target, the Mall, Kohls, Wal-Mart, and more! There are some special things I will ask for this year. You know those text-messaging phones - there are two in a pack. You can’t talk into them, but you can text message and you can take pictures with them. There isn’t any fee or anything like that. It’s totally cool! What I do for Christmas is I go spend the night at my grandma’s and grandpa’s house on Christmas Eve. My parents drop me off early so they can go to work during the night. My great-grandma and great-grandpa spend the night too. When I get there the turkey is waiting on the counter for me. I love digging my hand in the turkey. After I wash my hands, I decorate the Christmas tree. At home my tree is already decorated. Anyway, after dinner we open a few presents then we go to bed. When we get up on Christmas morning we open up the rest of the presents under the Christmas tree. Then around noon everyone else in the family starts coming over, even my parents after work. They all bring their gifts with them. When everyone is here we eat! We normally have what we had on Thanksgiving. And when everyone is finished eating, they say they are not going to eat for a week (just like Thanksgiving!). After dinner we open the rest of the Christmas presents. When we open up the presents I get really exited! I always get a lot of great stuff. I am so happy! I love all the stuff I get! When a present is in front of me I just tear it open. It’s a blast. When I go home my mom and dad have the presents they got for me waiting, so it’s like I’m in heaven again. 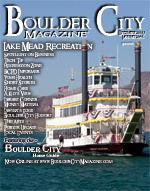 Tell me what you do for Christmas at info@bouldercity magazine.com.